The Kalashnikov stand at the Army 2015 International Military Technical Forum, Moscow, June 17, 2015. A plant to produce Kalashnikov assault rifles in Venezuela will be launched in 2019, Russian Deputy Prime Minister Dmitry Rogozin told reporters in Caracas on Dec. 7. "We expect the plant producing AK-103 assault rifles and munitions to run at full capacity in 2019," the deputy prime minister said after a meeting of a top-level Russian-Venezuelan commission. "The issues that existed some two or three years ago have been solved," he added. Russia has already delivered to Venezuela nearly all the equipment needed to launch the production, but the building is only halfway through completion. The two countries signed an agreement on building a factory for assembling the Kalashnikov assault rifles in Venezuela in July 2006. The document said Venezuelan technology experts and specialists would be trained for a full licensed production cycle of cycle of AK-103 guns. 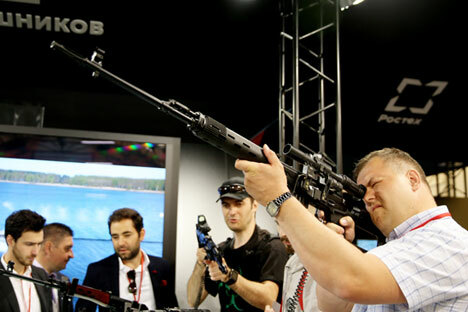 The factory is expected to assemble about 25,000 Kalashnikov automatic assault rifles annually.